Hard for them to compete for food and can/do bite each other. Thanks so much for the wonderful site!! (the Valentini has a bad habit of teasing the eel until he tries to bite him), not to mention that they need more water volume to begin with Along with these guys there are 2 baby damselfish (less than 1/2" each), one Clarkii Clown (~2.5 inches), 15 assorted dwarf hermit crabs and 10 assorted snails. unbelievably cute baby black-spotted dogface (~3 inches) to the mix. Unfortunately I just do not have space for a QT before I put things into my display tank, but luckily my LFS keeps their marine fish in individually filtered tanks and tends to take immaculate care of them. After checking the rest of the tank in the store for any signs of sickness I broke down and decided to take the baby dog face home. Once I got him into the tank (after drip acclimating for over an hour) I noticed a couple of strange circular discolorations on him. I've attached a couple picture of the discolorations, maybe someone more experience than me has seen this before? 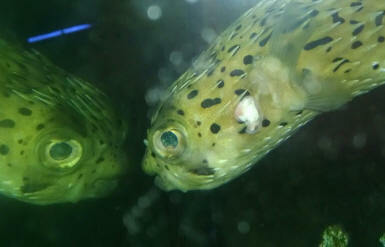 While I'm writing this email I do have one question about my Valentini Puffer, who I've had for about 3 months now. For about 6 weeks above his eyes there seems to be a little patch of skin missing, once every couple of days I see him scratch this spot on the rock. Again, he's eating fine (although I think that his beak was almost too long when I got him, I have to hold prawn to make sure that he gets a good bite out of it) and not displaying any symptoms other than a slightly elevated breathing rate. This too I cannot find a similar or accurate diagnosis online, I will try to get a picture to explain better. And again for the amazing website! Thank you so much for getting back to me so quickly! I'm so sorry about the giant pictures, I attached the wrong copies (I keep the hires ones for printing). While I'm very aware that the tank is too small, I just do not have the money or space to upgrade to the 150 that I would like to (we are also probably moving within 6 months, a large contributing factor) . I read every puffer page before I decided to ask a question, I see people mention blotches from stress et cetera but I just wanted to be sure I was experiencing the same thing as my marine hobby quickly becomes an obsession..
You say the dogface is also unsuitable here, is this due to the snowflake? Or just the fact that my tanks too darn small. I realize that the best solution for this tank is probably to remove the eel, I am only loathe to do this since I've raised him since he was only 5 inches or so but perhaps that's the only answer. I'm sorry for bugging you with questions, but no one I know is knowledgeable enough to help me.